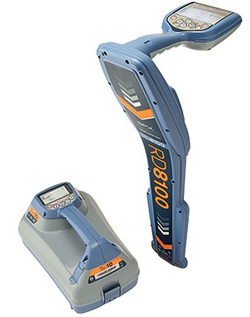 RD8100, our most advanced locator range delivers performance, quality and durability. Containing a unique arrangement of 5 custom manufactured, precision ground antennas, it allows you to choose the optimum level of precision for the job in hand. With utility infrastructures becoming more complex, locate professionals require more powerful, flexible tools. Features such as Current Direction and iLOC combine with the versatile Tx Transmitter range to deliver highly responsive locates even in tough conditions. Automatic usage logging with GPS positioning: GPS equipped RD8100 locators automatically log key locate parameters every second, providing a comprehensive picture of individual locates, or allowing you to assess usage patterns over periods of a year or more. The data generated can be used to ensure compliance with best-practice, or to identify training needs before poor work habits develop. Additionally, the data can be used for internal audits or shared with partners or clients to evidence task completion, or compliance to their requirements. Combine accuracy with speed – Peak+ mode: Combine the accuracy of Peak locating with the rapid ground coverage of Guidance arrows in the new Peak+ mode. A single key press lets you check for distortion by comparing Null with Peak. Use Power Filters™ to pinpoint and discriminate between power cables: When a signal transmitter can’t be connected, tracing individual power lines through complex networks can be a real challenge - conflicting or powerful signals confuse, or combine to create a wash of signal. Trace high impedance utilities with 4 kHz – and with CD: The 4 kHz locate frequency is designed for tracing high impedance lines such as twisted pair telecoms or street lighting. Since such utilities are often found in areas of dense infrastructure, you can combine 4 kHz with CD to ensure you follow the right line. Quickly follow lines with Guidance Mode: Guidance Mode allows you to rapidly follow the path of a buried utility. Intuitive proportional arrows, a directional ‘needle’ and differentiated audio tones guide you along the target pipe or cable. Customize the locator to your network frequencies: Up to 5 additional frequencies can be programmed into all RD8100 locators to match it to the signals found on your target networks. Fault Find: Combine the RD8100 locator with an accessory A-frame to identify and pinpoint insulation sheath faults to within 4" (10cm). Precision by design : A unique arrangement of five custom manufactured, precision ground antennas deliver locate accuracy and repeatability. Accurate surveying with integrated or external GPS: Save up to 1,000 survey measurements, capturing utility depth, and send to a mobile device using Bluetooth®. Add positional data with the integrated GPS option, or combine with external GNSS device using the wireless Bluetooth link to get the accuracy that you need. Save time on site with iLOC remote transmitter control: iLOC is an advanced Bluetooth link between the RD8100 locator and transmitter, which allows you to control the transmitter’s signal power and frequency from up to 1400’ / 450m away. Less time walking and more time locating. Shallow locate warning - StrikeAlert™ in active & passive locating: StrikeAlert reduces the risk of accidents by warning of the presence of shallow cables and pipes with both visual and audio warnings. Locate in difficult environments with Dynamic Overload Protection: Dynamic Overload Protection filters out interference, enabling use in electrically noisy environments such as substations or around overhead power cables. eCert – Certified confidence without downtime : Verify and certify the calibration of your locator over the internet using the RD Manager PC software package – without returning the unit to a service center. Have confidence that the RD8100 is ready for action whenever you are. Enhanced Self-Test: The integrity of the measurement system can be confirmed on-site. Self-Test applies signals to the locating circuitry as well as checking display and power functions. Set-up, calibrate and update your locator from a PC - RD Manager PC software: Download usage logging and survey measurement data for analysis, and set-up, calibrate and update your locator from a PC. Support when you need it: Over 40 years of working alongside users on-site gives us the confidence to back our product with a 3 year warranty, supported by our global service network.